Updegrove McDaniel McMullen & Chiccehitto, PLC (UMMC) believes in and promotes a culture of teamwork within our firm, with our clients, and within our community. We value each of these relationships and we are committed to the success, security, and quality of life of each one. We provide a progressive workplace environment and embrace curiosity and innovation. We honor and support our team members’ work/life balance. UMMC invests in developing our team members both professionally and personally. 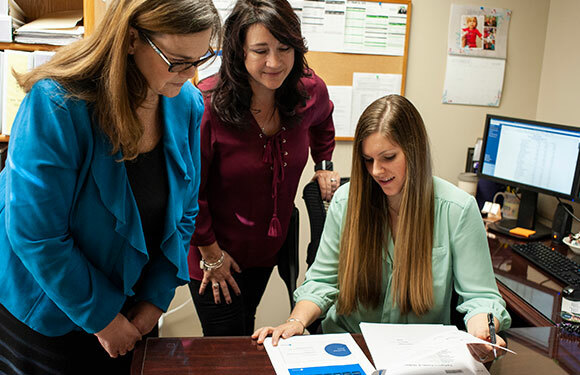 We help our team members achieve their professional and personal goals on a timeline that works best for them. Our cloud-based environment makes it easy to work from anywhere–not just at the office. Fun team-building events and celebrations are held throughout the year. These enjoyable events foster a strong team spirit and collaboration. Our goal as your employer is to provide you with the tools you need to succeed. We offer a full range of resources that facilitate achieving your full potential. We support career development through mentoring, knowledge-sharing, and continuing professional education. Professional advancement is available through a structured career path as the requirements of each level are met. Experienced Tax Professional (CPA a plus) in our Warrenton office – Please view our Tax Professional position details here. Please contact us at belefante@ucmplc.com to explore joining the Updegrove McDaniel McMullen & Chiccehitto, PLC Team.